I’m not really sure what to call what I baked tonight, hence the title… The original recipe calls it a cake, so I guess they’re cupcakes? Except that they haven’t got frosting, and they’re maybe a little healthier than your average cupcake, and you could possibly eat one for breakfast. So maybe they’re muffins? Regardless, they’re yummy :). Today was the second rainy day in a row, which normally wouldn’t be too bad, except that we had absolutely gorgeous weather over the weekend. I was in short sleeves and flip-flops Saturday and Sunday – it was awesome!! And now it’s back to normal spring weather, including lots of rain. So after sitting at my desk all day, staring at my computer and wishing it were the weekend again, I decided I need to bake something. I realized while I was eating my lunch that I had an extra container of vanilla yogurt at home, and got to wondering whether or not I could substitute the vanilla yogurt for plain yogurt in this one recipe I have for banana bread/cake/whatever. 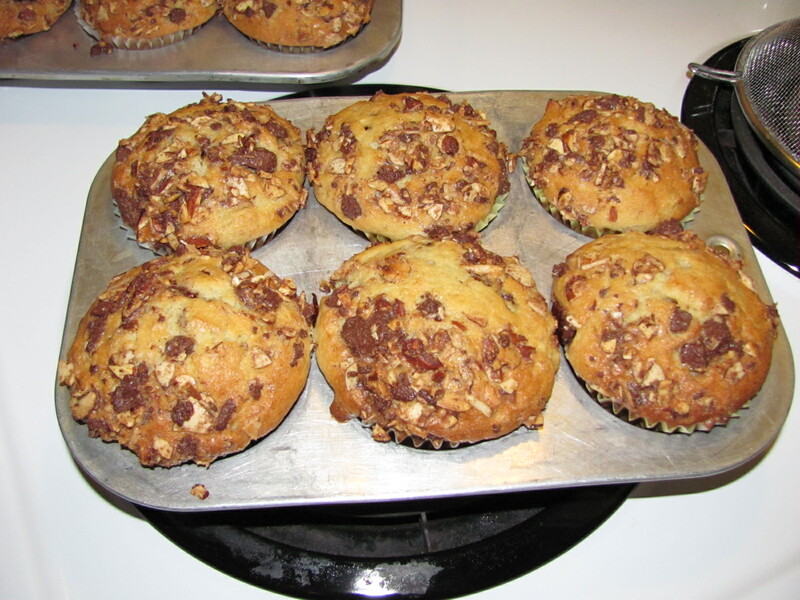 It’s also got chocolate and cinnamon and walnuts in it, at least in the original recipe – I changed a couple of things around… I thought maybe making cupcakes/muffins would be better than making a whole cake – they’d be easier to freeze, share, etc. – and I’m really not a fan of walnuts (except when they’re in baklava) so I opted for almonds instead. Preheat oven to 375°F with rack in middle. Line muffin tins with 18 liners. Beat together softened butter (1 stick) and 3/4 cup sugar in a medium bowl with an electric mixer at medium speed until pale and fluffy, then beat in eggs 1 at a time until blended. Beat in bananas, yogurt, and vanilla (mixture will look curdled). With mixer at low speed, add flour mixture and mix until just incorporated. Toss together chocolate, nuts, cinnamon, melted butter, and remaining 1/4 cup sugar in a small bowl. Place about 1 good-sized spoonful (just a regular spoon) of batter in each liner – you should go through half of the batter – then half a spoonful or so of the chocolate mixture on top of that (again, going through about half of the mixture). Divide the rest of the batter evenly on top of the chocolate mixture, smoothing the batter to cover the chocolate in the middle. Spoon the rest of the chocolate mixture on top of each muffin. Bake for 24-27 minutes, or until the tops are golden and a toothpick inserted in the center of the cupcakes comes out clean. *Alternately, you can also pour half of the batter into a buttered 9-inch square pan, sprinkle half of the chocolate mixture over that, pour the remaining batter over than, sprinkle the top with the rest of the chocolate, and bake for 35-40 minutes. After writing this, eating one, and thinking about it, I’m still not sure whether these should be muffins or cupcakes… although I’m leaning towards muffins, because then if I end up eating one for breakfast, I won’t feel as guilty! And just FYI – this recipe (cake or cupcake/muffin) tastes better warm – the chocolate gets nice and melty and gooey.